Teton Conservation District staff spent a day in the field last week with Kellen Lancaster, who represents Area IV (which includes Teton County) on the Wyoming Water Development Commission (WWDC). Kellen is one of ten commissioners appointed by the governor to “ensure the delivery of water to Wyoming citizens in an economical and environmentally responsible manner.” Kellen is a resident of Afton, husband, and father of six. He brings a wealth of experience having served on other boards, and through his experience owning and managing a sand, gravel, and rock crushing business in Star Valley. Kellen and TCD’s Executive Director, Tom Segerstrom, out in the field. From dawn until dusk, Kellen visited five of six proposed water projects in Teton County that he and his fellow commissioners will vote on funding in March. The six applicants are seeking funding through the Small Water Project Program (SWPP), which is a grant program administered by the WWDC in partnership with sponsoring entities across the state, including Teton Conservation District. SWPP aims to improve watershed condition and function, and benefit wildlife, livestock, and the environment. Past projects have included the construction and rehabilitation of small reservoirs, wells, springs, wetlands, solar platforms, irrigation works, windmills, and other related efforts. Fish passage restored during dam removal project phase. Looking upstream at Spread Creek Dam prior to project construction and removal. 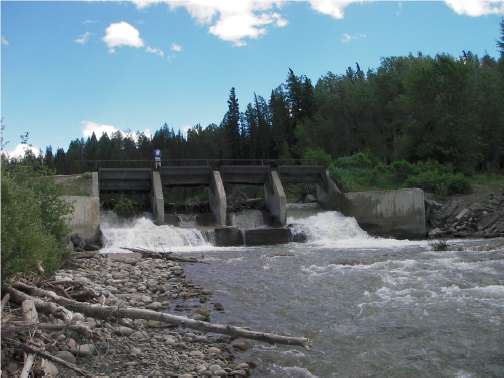 Spread Creek Irrigation Rehabilitation and Fish Passage: In 2010, the crumbling Spread Creek dam, located just outside Grand Teton National Park on Bridger-Teton National Forest lands, was removed. This partnership effort led by the Trout Unlimited Wyoming Water Project opened up over 50 miles of Spread Creek to migratory Snake River cutthroat trout for the first time in over 50 years. Since the dam was removed and replaced with a fish passage-friendly diversion structure and new water delivery system, project partners have documented successful fish movement through the new diversion. But they have also documented fish entrained in the Spread Creek irrigation system. The proposed Phase 2 of the Spread Creek Fish Passage project will reduce future losses of migratory cutthroat trout in the irrigation system by installing a fish screen that will return entrained fish to Spread Creek, and will stabilize and improve the diversion structure (which was damaged by flooding in 2011) for more reliable water delivery for irrigators. Game Creek Irrigation System Improvement: This project aims to improve irrigation efficiency, stream function, and fish passage by constructing a permanent irrigation structure and headgate on a Wyoming Game and Fish Department property used to pasture horses critical to the job duties of the South Jackson Game Warden. Snake River cutthroat trout are abundant in Game Creek below the proposed project site and would have historically accessed habitats further upstream. In order for the fish to reach those upstream habitats again, connectivity during key time periods such as spawning, is of the utmost importance. The Wyoming Department of Transportation has already made substantial investments downstream in Game Creek that will allow for fish passage. This project will complement that component of the South Highway 89 reconstruction project and will showcase a working relationship between aquatic stewardship and agriculture. A giant boulder that was displaced in the 2007 Jensen Canyon debris flow event. Jensen Canyon Headgate Rehabilitation: In the spring of 2007, a debris flow event wiped out a diversion structure at the bottom of Jensen Canyon. The proposed replacement structure will divert the water from Jensen Creek into three separate waterways, which supply water to fifteen separate residential and agricultural uses downstream. This water project supports the preservation and stewardship of open space and agricultural heritage by improving the reliability of delivering adjudicated water rights to their corresponding agricultural and residential lands. Further, the public will benefit from continued agriculture and preserved views, and the project will lessen risk of downstream flooding of residences and roads. 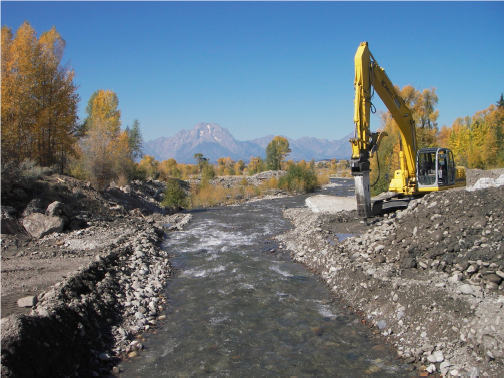 South Flat Creek Fish Passage and Channel Restoration: This project demonstrates how goals of restoring aquatic ecosystems and persevering working ranch lands can intersect. This first phase of this project involves channel realignment of Flat Creek on Lockhart Cattle Company land. Construction of the new channel will restore ecological function by increasing bank stability, reducing erosion, and improving the availability and quality of native fish and riparian habitat. The project will also improve water quality through restoration of wetlands which filter sediments, nutrients, and pollutants. Fall Creek Ranch Water Supply Improvement: Fall Creek Ranch, a remote subdivision surrounded by Bridger-Teton National Forest, plans to develop a water supply for fire suppression and irrigation purposes. The 3.66-acre grass pasture to be irrigated will be used to pasture livestock and will provide an irrigated ‘safe’ zone on three sides of one of subdivision’s the structures, reducing the risk of wildfire reaching the structure. This project will provide a source of fire suppression water not only for Fall Creek Ranch, but for Redtop Meadows and surrounding public lands as well. Kellen and Tom heading out to look at the proposed 7 Mile Ranch Rural Community Fire Suppression project. 7 Mile Ranch Rural Community Fire Suppression: This project serves to increase reliable fire suppression water storage and supply for a rurally located residential property and surrounding public land. The landowners plan to develop a surface pond and water delivery infrastructure, including a pump leading to pressurized fire hydrants. This parcel is located within Teton County’s Wildland Urban Interface mapped zone and fire suppression apparatus response time to this site is at least one hour by vehicle. This area has the potential to support a wildland fire posing a direct threat to homes, utilities, transportation corridors, communication sites, and other capital improvements. If you have questions about SWPP grants or would like to consider applying for funding next year, contact Robb Sgroi at robb@tetonconservation.org or (307) 733-2110.